Few youngsters have spun heads as much as two-year-old filly Miss Amelia, who makes her debut at Nowra on Sunday. 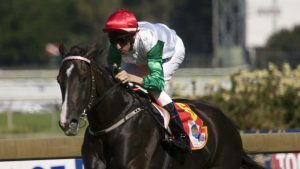 A daughter of More Than Ready from the high-class mare Amelia’s Dream, who is by the recently deceased Redoute’s Choice, Miss Amelia is unbeaten in three trials, the most recent an impressive performance in heavy ground last week at her Warwick Farm base. Amelia’s Dream burst on to the scene as a star two-year-old just over a decade ago, winning her only two starts, including a dominant display in the group 2 Silver Slipper before injury brought an abrupt end to a career that could have been anything. Miss Amelia debuts over 1000m at set weights for leading metropolitan trainer Bjorn Baker and is well in on the limit weight for two-year-olds getting as much as 4 kilograms off the colts. But as good as she looks, it shouldn’t be a complete stroll in the park. Kembla trainers Robert and Luke Price will give a first start to their nice filly and smart trial performer Noble Belle. Three-year-old filly Tell No Tales, who made her debut against Golden Slipper winner Estijaab last autumn, returns after a near nine-month break for fellow Warwick Farm trainer Matthew Smith. And Anthony Cummings will start five-year-old mare Unimaginable for the first time off three fairly quiet trials, having scratched her from Wyong yesterday. Elsewhere, unbeaten four-year-old Hawkesbury mare Meditate looks hard to beat again in race five over 1200m. A daughter of So You Think, also from a Redoute’s Choice mare, Meditate picked up where she left off in the spring, resuming with a dominant win at Bathurst and goes up only one kilogram for this slightly tougher assignment.